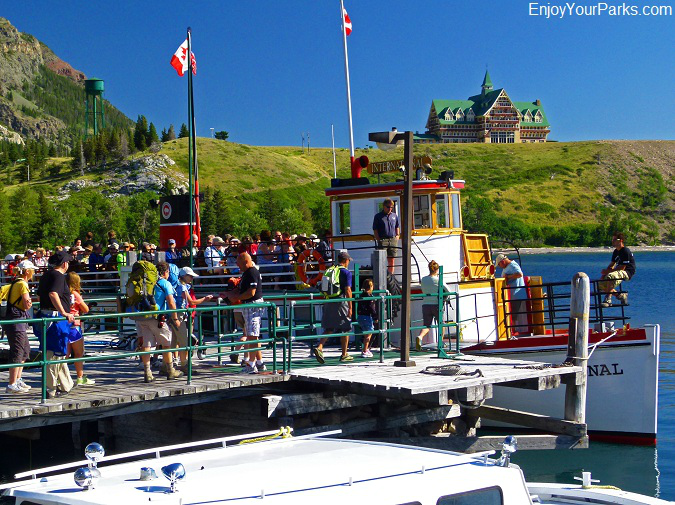 The Waterton Lake Boat Tour features the historic boat "International". This is a view of the Waterton Lake Area from what's known as "The Bear's Hump". 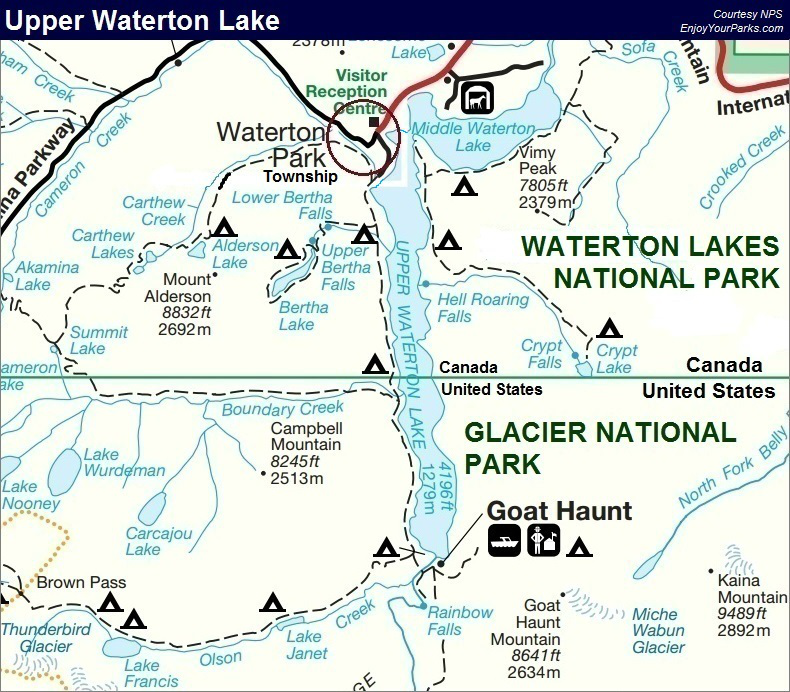 This photo shows you the route the Waterton Boat Tour takes up Waterton Lake to Goat Haunt Montana. 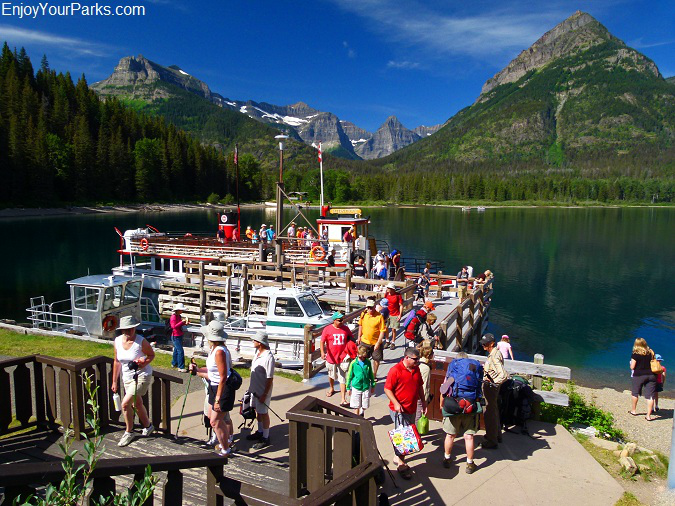 The Waterton Lake Boat Tour is one the most popular activities in Waterton Lakes National Park. This 7 mile boat ride on the gorgeous Upper Waterton Lake takes you from Waterton Township all the way to Goat Haunt Montana. Goat Haunt is located in Glacier National Park Montana at the southern tip of Waterton Lake, which is the head of the lake. Goat Haunt is known as "The Gateway To The Northern Wilderness of Glacier National Park", and the scenery is breathtaking the entire way. 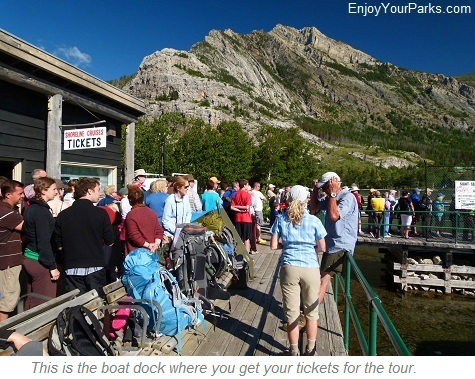 An additional bonus is the tour guides and captains make the Waterton Lake Boat Tour an extremely entertaining and enjoyable experience for the entire family. The boats that are used for Waterton Boat Tour are wonderful. 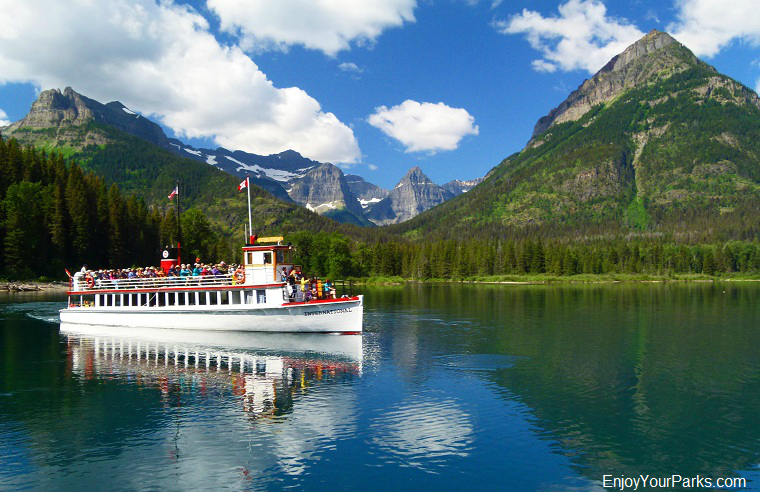 The most popular Waterton Tour Boat is the historic "International", which was built in 1927. This famous wooden boat was made in the United States and is certified each year by the U.S. Coast Guard. This double-decker classic is an absolute joy to ride on... so if you get the chance, we highly recommend that you choose this Waterton Tour Boat for your Waterton Lake Boat Tour. The other Waterton Tour Boat is "Miss Waterton". This newer Waterton Tour Boat is also a beautiful vessel and is certified each year by the Coast Guard, but lacks the "charm" of the historic "International". Either way, no matter which Waterton Tour Boat you choose for your Waterton Boat Tour, you will have a great time on the lake. Click Here for the boat ride to the Crypt Lake trailhead. In 1932, Waterton Lakes National Park in Alberta Canada and Glacier National Park in Montana U.S.A. combined to form the first ever International Peace Park, and the Waterton Lake / Goat Haunt area really is a shining example of this international cooperation. Half of Waterton Lake is in Canada, and the other half is in the United States (Glacier National Park). 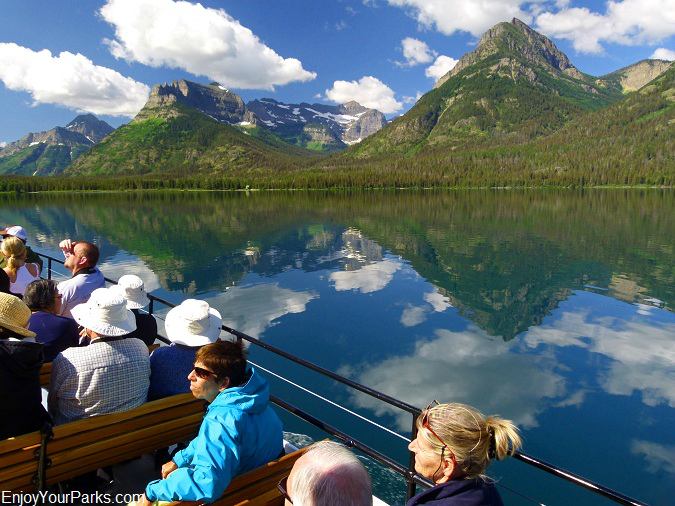 By these two great countries working together, the Waterton Lake Boat Tour is made possible, and it truly "connects" these two incredible national parks together. There is a ticket office located at the main dock, and you can usually get your tickets the same day that you'd like the tour, but we recommend that you get them the day before just in case... especially during busy holiday weekends. And if you are planning to do some hiking at Goat Haunt, make sure you take the earliest boat tour possible, which is usually about 10 o'clock in the morning. This will give you some time to enjoy your hike and still be able to catch the last boat back to Waterton Township. The dock is located at the northern section of Waterton Township, just below the famous Prince of Wales Hotel. You can't miss it. Visitors loading onto the historic "International". Notice the historic Prince of Wales Hotel up on the hill. 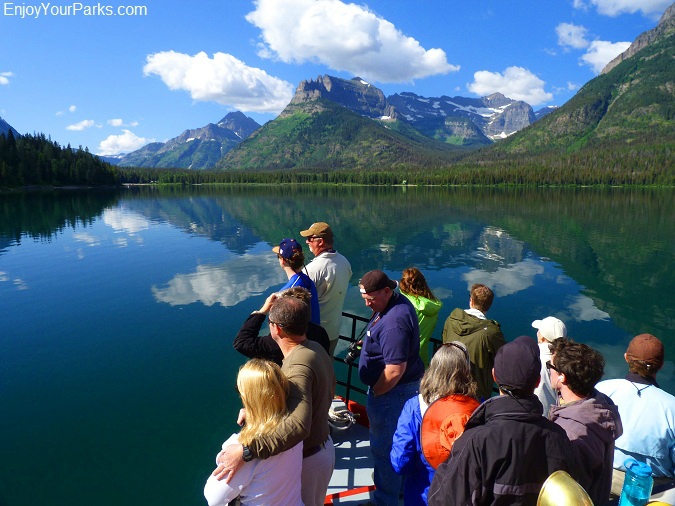 The Waterton Lake Boat Tour lasts about 2 hours and 15 minutes, which includes a half hour stop at Goat Haunt where guests can explore the Goat Haunt area in Glacier National Park. However, if you want to take any of the hiking trails at Goat Haunt, you will need your passport to get through the U.S. Port of Entry at Goat Haunt. There are several tours each day, which means that if you'd like to spend some time enjoying one of the day hikes that are available at Goat Haunt, then you can catch another Waterton Tour Boat back to Waterton Township later in the day. If you want more time at Goat Haunt, make sure you take the early boat. Guests enjoying the incredible view from the historic "International" on their Waterton Boat Tour heading for Goat Haunt Montana in Glacier National Park. The Waterton Boat Tour leaves the dock at Waterton Township and works its way up the 7 mile long Waterton Lake towards the far southern tip of the lake where Goat Haunt Montana is located. The scenery the entire way is incredible, and your Waterton tour boat guide will point out all the fascinating features of the area. Make sure you bring your camera! And if wildlife is spotted on the shores, such as bears or moose, the boat captain will slow down and even stop sometimes so you can enjoy the experience. 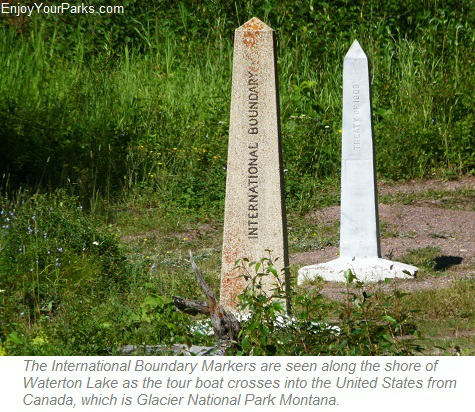 About halfway through your seven mile Waterton Lake Boat Tour, your boat will cross the international boundary back into the United States. You are now in Glacier National Park Montana. There is a monument on the shore marking this boundary, as well as an actual "line" drawn across the landscape by the cutting of vegetation. Again, because of the cooperation between Canada and the United States, and the creation of the Waterton-Glacier International Peace Park, this is made possible. Otherwise, this line would be the end of your tour. This is definitely the easiest border crossing you'll ever have in your entire life! 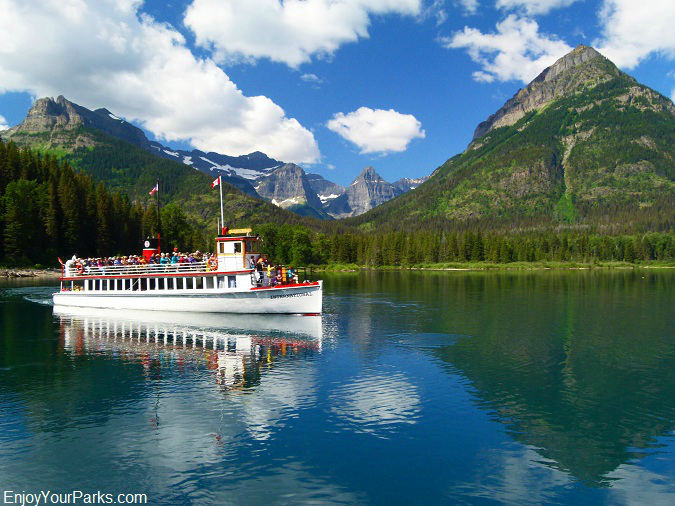 The view from the bow of the historic "International" is breathtaking as this famous boat heads toward Goat Haunt Montana in Glacier National Park. Goat Haunt is known as "The Gateway to the Northern Wilderness of Glacier Park", and the scenery here is absolutely breathtaking! Your Waterton Boat Tour will stop here for about a half an hour so you can explore the area. The "International" is now docked and visitors leaving the boat to explore the Goat Haunt Area in Glacier National Park during their Waterton Boat Tour. The boat will remain docked for about a half an hour. If you want to go on a day hike, you can catch a late afternoon boat back to Waterton Township. 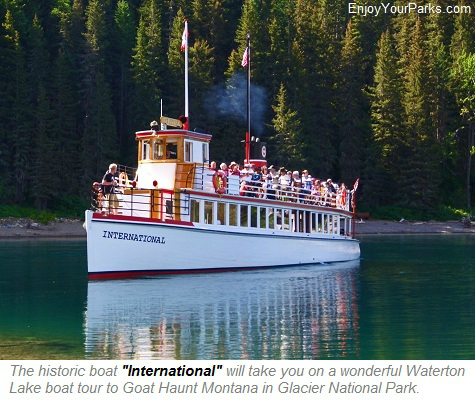 Once you get to Goat Haunt Montana in Glacier National, your Waterton Tour Boat will dock, and everyone will get off the boat to explore the Goat Haunt area for about a half of an hour. Goat Haunt is a very special place that has a lot of history and a lot of international significance. 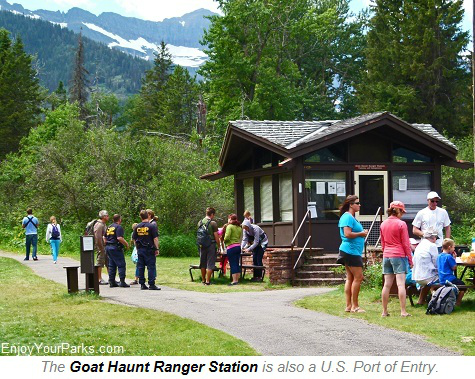 At Goat Haunt Montana there are bathrooms, an International Peace Park Pavilion, a nice beach, hikers' shelters and a Ranger Station. Just beyond the Ranger Station is where the trailheads to the remote Northern Wilderness are located, however you cannot enter these trails without a valid passport. Goat Haunt Montana is a United States Class B Port of Entry. 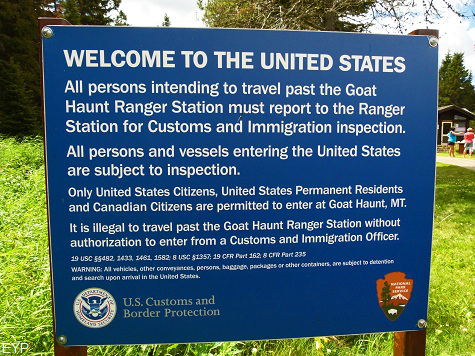 This means that only U.S. and Canadian Citizens are allowed to go beyond the Goat Haunt Ranger Station. There will be U.S. Customs Agents at the Ranger Station checking everyone's documentation. The only people who can enter the Goat Haunt trail system are those who have current and valid passports. Goat Haunt Montana is known as "The Gateway to the Northern Wilderness of Glacier Park". The trailheads at Goat Haunt allow access to some of the most scenic and remote wilderness multi-day hikes in all of North America. 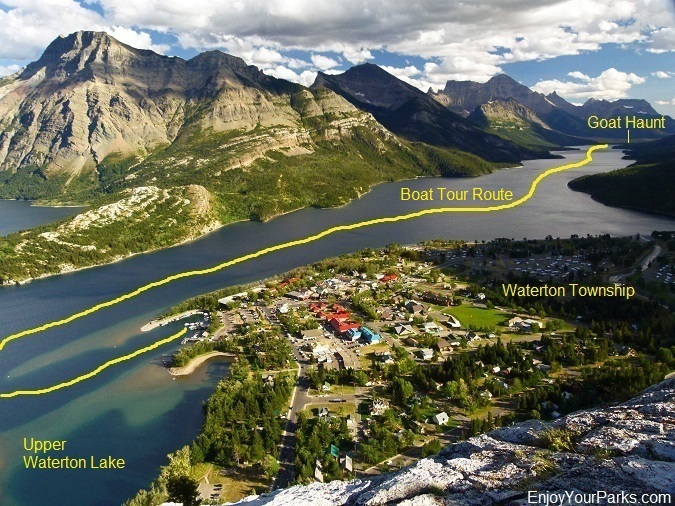 Because of this, the Waterton Lake Boat Tour also acts as a "shuttle service" for overnight backpackers going into the northern Glacier Park wilderness, or coming out of this remote area. Therefore, you'll see plenty of overnight backpacks on the boat. For all the details on the overnight hikes available at Goat Haunt, click here. Goat Haunt offers three popular day hikes that are short enough where you can have time to catch an afternoon boat back to Waterton Township. But make sure you come on the early boat so you have time to enjoy your day. The three day hikes are Kootenai Lakes, Goat Haunt Overlook and Rainbow Falls. For all the details on Goat Haunt, including the three day hikes, click here. 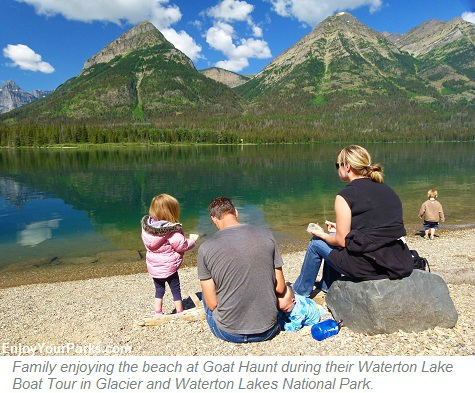 Once you've explored Goat Haunt, you will then return to the Waterton Lake Tour Boat, and your boat will then take you back to Waterton Township. The boat ride back to Waterton Township is actually a completely different Waterton Boat Tour because the captain will take the boat near other points of interest, and the boat tour guide has a completely different presentation. It's very entertaining, informative and interesting. Without a doubt, if you're visiting Waterton Lakes National Park, you really should consider taking the Waterton Lake Boat Tour. We can assure you that you and your family will thoroughly enjoy it! 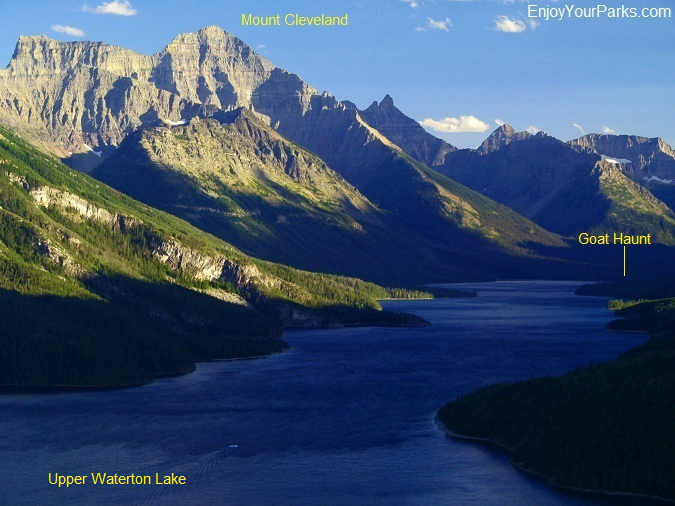 Mount Cleveland, the tallest mountain in Glacier National Park, towers above Goat Haunt Montana.